By using this website, you are agreeing to comply with and be bound by the following terms and conditions of use, which govern the DDA’s relationship with you in relation to this website. If you disagree with any part of these terms and conditions, please do not use our website. 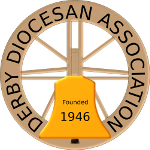 The terms ‘Derby Diocesan Association of Church Bell Ringers’, ‘DDA’, ‘us’ or ‘we’ refers to the owner of the website. The term ‘you’ refers to the user or viewer of our website. This website contains material which is owned by or licensed to us. This material includes, but is not limited to, the design, layout, look, appearance and graphics. Reproduction is only permitted under the Creative Commons Attribution-ShareAlike licence i.e. you must acknowledge the author (DDA) in any works derived from this site. This website also includes links to other websites. These links are provided for your convenience to receive further information. They do not signify that we endorse the website(s). We have no responsibility for the content of the linked website(s). The DDA collects your data in compliance with General Data Protection Regulations and abides by its data protection principles. Personal data is held to maintain membership and tower contact records, and to record subscription payments. This data is available for members and/or the public to view on-line where permission has been given. Please note that the DDA does not pass any of its data on to third parties. Read our GDPR statement for more information.